The World As I Am returned to Beechmont, contracted to the Scenic Rim Council. Over these 3 weeks, 3 separate zones have been the main focus of works on this beautiful mountain. Firstly, the Windabout Rd Reserve site with the assistance of the Green Army. Nell Scott Park and the revegetation site west of Beechmont State School. Within the Windabout Reserve a further 3 sites were identified as priority habitats. Two of three zones had the assistance of the Green Army which proved to be a contributing factor to the success of the outcome. Zone 1 and 2 consisted of site preparation for the planting of native vegetation. Zone 1 consisted of mostly herbaceous weeds. Previous works must have included blanket spraying using Glyphosate which would have killed everything but left the ground exposed. With a rich source of weed seed bank within the soil and no follow up work or planting, this was always going to result in the same weed species growing back. And it did. But this time, after site preparation, follow up plantings were implemented, with mulch spread to supress the weeds and allow the native species to have a head start. Assisted revegetation is required in the zone as the herbaceous weeds will return but with consent monitoring and weed control, this site has every chance to regenerate. The World As I Am is tasked to make this happen. Zone 2 is the next zone to benefit from constructive regeneration. To date, the site has been prepared and almost ready for planting. This site consisted of herbaceous weeds such as cobblers pegs, Crofton weed, Mist Flower predominantly, but also contain a vast number of woody weeds, primarily Easter Cassia, Lantana and Broad Leafed Privet. Most of this zone has been cleared but after discussions with Beechmont Landcare Group, they presented that their organisation would like to play a major role in the rehabilitation of this zone, incorporating specialised techniques which was very welcoming. So now the community is also involved. Couldn’t be happier. Zone 3 is ongoing. This zone contains a Privet infestation so dense that one could look at it and think… where the hell do I start. With density consistent with 100 stems per metre square of Privet at all stages of maturity. But surprisingly, native species within this habitat is consistent. Generally, 1 per 2 or 3 metres square. 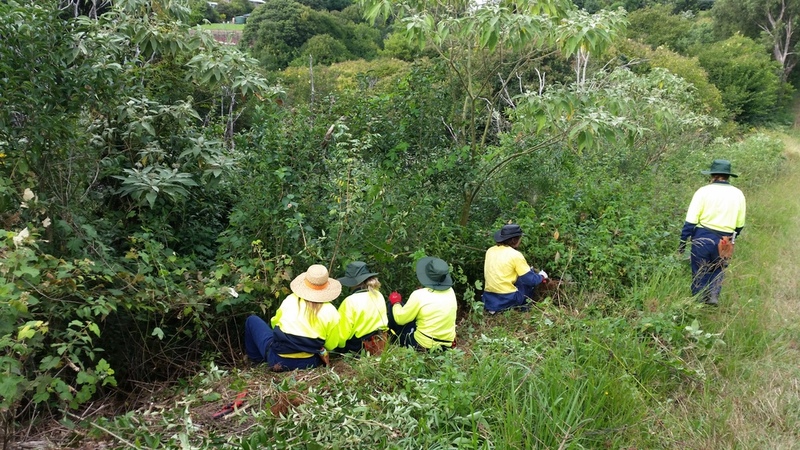 Although this habitat is dominated by weeds at a ratio of 300 to 1, by removing the Privet threat and allowing the native species to establish, it is possible that this zone can regenerate without constructive revegetation. This site will be monitored over the next few months to determine to best approach but I am confident that assisted regeneration will be the primary solution for this zone.